May the splendor of your glory dawn in our hearts, we pray, almighty God, that all shadows of the night may be scattered and we may be shown to be children of light by the advent of your Only Begotten Son. Who lives and reigns with you in the unity of the Holy Spirit, one God, for ever and ever. Bringing with us the shadows born of an age-old error. According to the 1962 Missal of St. John XXIII the Extraordinary Form of the Roman Rite, today is the feast of St. Eusebius which is celebrated in the Ordinary Form of the Roman Rite on August 2. Historically it is also the feast of St. Adelaide, daughter of the king of Burgundy. Throughout her life, she received strong support from the abbots of Cluny, with whom she was on terms of close friendship. 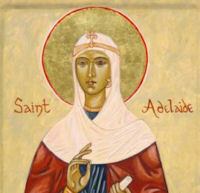 St. Adelaide was a truly remarkable woman. She was the daughter of the king of Burgundy, and was married to the son of the ruler of Provence as a means of ending a feud. When her husband was murdered by a rival prince, she was shut up in captivity until freed by Otto I, who became Holy Roman Emperor and Adelaide, his Empress. She ruled with her husband until his death, at which time her jealous daughter-in-law had her banished from the court twice! Yet she remained steadfast and faithful, known for her liberality in giving and her piety; and eventually she was restored to court as the regent for her grandson Otto III. She was active in the reforms of the great abbey at Cluny, and reposed in 999. Despite her exalted status, she was a wife and mother, and lived both hard times and good, always faithful to her Lord, and always ready to give generously to those in need. She never took revenge on her political enemies once she gained the regency and it was said that her court was much like a monastery itself in its piety. She is a reminder to me that regardless of how much or how little I may have, my work remains the same. Read more about St. Adelaide here, here and here.